Let’s be fair to ourselves and answer the question who am I. Am I amiable or aloof? Think of the academic year. How did you spend it? Did you just sit in your room and not go to hang out with your peers? If yes, then feel sorry for yourself because you did not see what it is like to have a student’s life. During four years of studying at Chonnam National University (CNU), you will have had opportunities to meet new faces and to train your sociability for future perspective jobs. Are not you excited? So do not be a wineskin, go out and spend quality time with your friends. However, there are multiple kinds of personalities we encounter in our day-to-day lives; strong, charismatic, open-minded, introvert, and extrovert and so forth. All these characters are contributory factors to our overall happiness and sadness. Which personality is the most important for having global friends or for being in the spotlight? Yes! Definitely, sociability is the idiosyncrasy that makes people stand out of the crowd. Therefore, sociable people possess effective relationships with others. Many individuals naturally display sociability traits, such as friendly and outgoing attitude, self-control, adaptability, integrity and team spirit. As everybody knows that sociability is an important characteristic when you are a student, on the grounds that everyday you meet up with new people and you talk to them, you need to have an open mind to understand and accept different people. Especially as, in almost in every class, you are given team projects and you have to complete the given tasks successfully by supporting each other and most importantly by understanding one another. On the other hand, this is a great opportunity to make friends during academic years. Moreover, here at CNU, there are so many opportunities created for students who are looking forward to having global friends. For example, they may join on-campus clubs and participate in the cultural trips and programs of the Office of International Affairs (OIA). Generally, it takes some minutes to check information online and for the prize, you get long lasting friends with whom you will enjoy your time. International students are joining clubs on campus and spending quality time together as well learning about each other’s cultures and sharing their knowledge. Ibragimova Kamola (Sophomore, Faculty of Business Administration) shares her warm impression, “I have been attending CNU Taekwondo Club for a year. To be honest, before I thought that was just transitory interest but it turned to my daily routine. 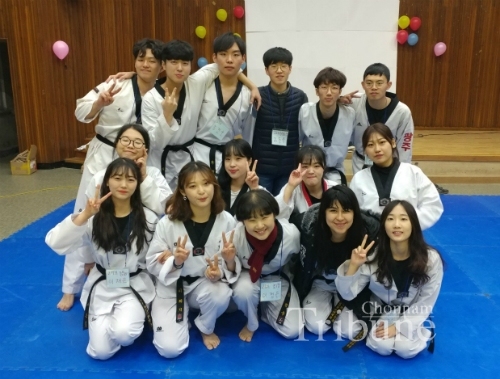 Now, I cannot imagine my life without taekwondo and this is because of the members of my club. They are like my old dear friends and very warm as well they are my first Korean friends”. “Being sociable” does not mean that you have to hit the bar scene, or join every club that exist at CNU. It means that you discover what a rich, fulfilling social life looks like for you, as in the old saying “Do not wait for people to be friendly, show them how.” Do not get stuck in a rut, try new things and spend a delightful time with international people. This is a chance that will never be given again.